Last week, the European Commission launched #EUSavesLives: a campaign to raise awareness on the EU’s response to natural or man-made disasters: EU Emergency Response in Europe and worldwide. The EU is the world’s leading donor of humanitarian aid and EU-funded projects contribute to saving and improving lives of people affected by crises by providing them with basic needs, education and protection. The EU also helps to coordinate response to disasters in Europe and worldwide via its Civil Protection Mechanism. The #EUSavesLives campaign on EU Emergency Response showcases the positive aspects that the EU brings to everyday life of European citizens and those in need worldwide. The key messages are conveyed in an innovative way: via virtual reality. The campaign is a travelling exhibition which will be launched in Vilnius and travel across several European cities: Bucharest, Berlin, Rome, Marseille and Madrid between April and July 2018. Overall, the campaign aims to raise awareness among Europeans about EU’s actions in response to natural and man-made disasters as well as the importance of humanitarian aid and civil protection based on our principle of solidarity. 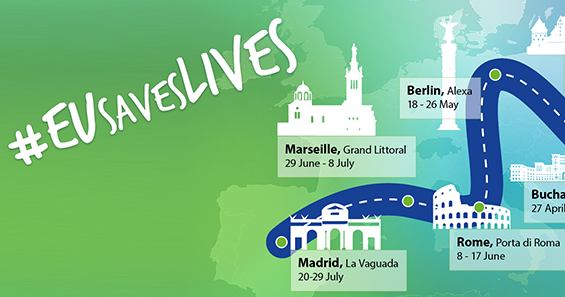 To know more about #EUSavesLives, check the campaign webpage.